With apologies to the blind, it should be apparent to all Christians that the Faith, and the Church, is under attack. On the one hand, Muslims are waging genocidal Jihad against Christian communities, especially in the Middle East, and on the other, aggressive secularism is working to erode Christian culture in the West. In this context, Christ’s prayer that “they may all be one” (John 17:21) takes on a special immediacy. It doesn’t take any great degree of imagination to suppose that the recent wave of anti-Christian, pro-gay legislation in the U.S. and Europe would have had a very different outcome if it had come against a vibrantly united Church. The same thing is true with the ongoing scandal of abortion, or outlawing prayer in US public schools. Would either enjoy government sponsorship, in Planned Parenthood’s case, to the tune of hundreds of millions of dollars, in the face of strong, united, Christian opposition? By the same token, would the apparent inability of the West to defend Christians in Syria and Iraq be possible if governments were held to account by a powerful, united Church? Possible, yes, but much harder. In brief, the old adage holds true, united we stand, divided we fall, to say nothing of the Gospel imperative for unity. 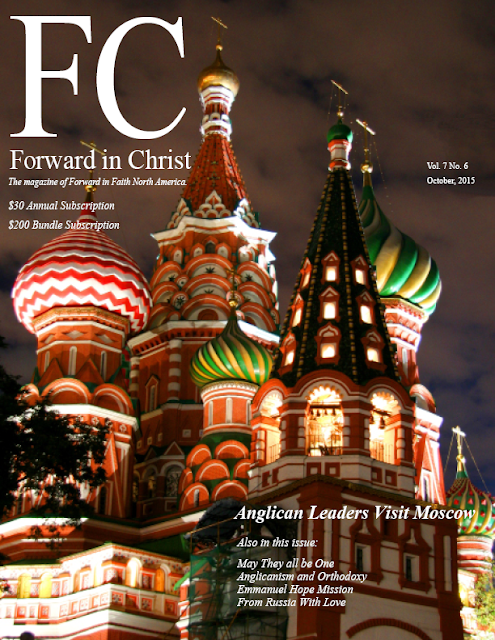 Archbishop Foley Beach’s recent visit to Moscow this August, with a delegation of conservative Anglican leaders, took place against this backdrop. Invited by Patriarch Kirill, the head of the Russian Orthodox Church, the Anglican delegation met with Metropolitan Hilarion of Volokolamsk, and the Patriarch himself, to explore ways in which their respective Churches could move towards the unity for which Christ prayed. They did so with encouraging precedent. “As a result of pioneer work by Anglicans such as William Palmer (1811-1879), J. M. Neale (1818-1868), and W. J. Birkbeck (1859-1916),” writes Ware, “firm bonds of Anglo-Orthodox solidarity were established by the end of the nineteenth century.” (The Orthodox Church, Timothy Ware, Penguin, c. 1993, p. 318). This solidarity continued into the 20th century, with increasingly formal efforts to explore union between Anglicanism and Orthodoxy. These culminated in the setting up of the Anglican-Orthodox Joint Doctrinal Discussions (AOJDD) Commission in 1966, subsequently renamed as the International Commission for Anglican-Orthodox Theological Dialogue (ICAOTD) in 1990. The work of the ICAOTD has been fruitful, resulting in a series of joint statements: The Moscow Agreed Statement, 1976; the Dublin Agreed Statement, 1984, and the Cyprus Agreed Statement, in 2006. These reflect a significant level of agreement on key points of doctrine and ecclesial identity, such as: Knowledge of God in its trinitarian and ecclesial context; Inspiration and Authority of Holy Scripture; Scripture and Tradition; Authority of the Ecumenical Councils; the Filioque clause in the Nicene Creed; the Church as Eucharistic Community, and the Invocation of the Holy Spirit in the Eucharist. Strong words, and they imply something very like a death knell to meaningful ecumenical dialogue with a Communion that allows the ordination and consecration of women, and appears unable or unwilling to discipline those provinces which actively promote homosexuality within and without the church. There can be no doubt that the Anglican Church in North America wants to be loyal to the latter model. Will this loyalty extend to an embrace of the catholic principles outlined in the Agreed Statements of the last 40 years? More than that, will it result in the cessation of the ordination of women, without which sacramental unity with Orthodoxy is impossible. Christ’s high priestly prayer in John 17, and the increasingly virulent assault on Christianity, argue that a successful resolution to the above questions is a matter of urgency. By the grace of God, the Anglican-Orthodox dialogue will continue until unity is achieved.